The Monument to the Rt. 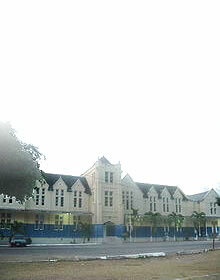 Excellent Norman Manley was designed by H. D. Repole and was dedicated on September 16, 1972. 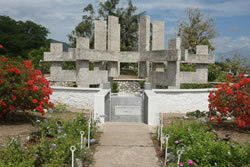 The Monument emphasises six salient aspects of Norman Manley's life and work. This is expressed by six vertical members tied on by a ring at a higher level and accentuated by complementary vertical shafts rising to a height above the ground. The original design required six plaques, which would depict the notable aspects of the hero's life. This was later modified, due to financial constraints, and two sculptures were created by Christopher Gonzales in 1974. 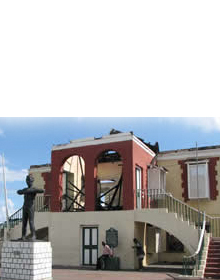 Gonzales conceived the sculptures to encompass all the people of Jamaica, to transcend the individual and to magnify the essence of Manley. 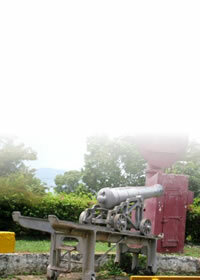 The themes of the sculptures centre on birth and unity of the nation. One piece is a paternal figure. He is the messenger of a new era. The other is a maternal figure. She is the earth mother.